I found these handsome little handles on some old cabinet that was getting thrown away and I knew exactly how I could reuse them. The nesting box has never looked so good. And it's never been easier to fetch the eggs. Yes. 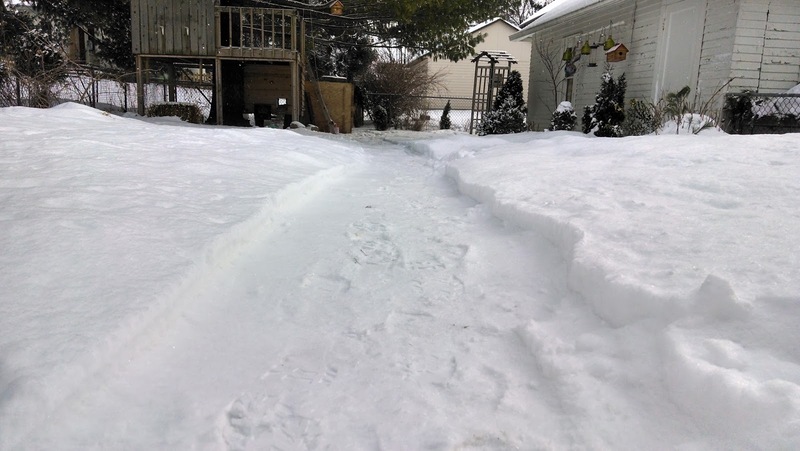 I snow plow a path in the backyard for the coop. The weather has been brutal this winter. I don't ever remember a season with so many days below zero as this one. I'm pretty sure it lead directly to the loss of Crusher. But even before it fell below zero, I was still struggling to find an (economical) way to keep their water from freezing. Rather than running the electricity for an expensive heated water dish, I took a DIY approach. 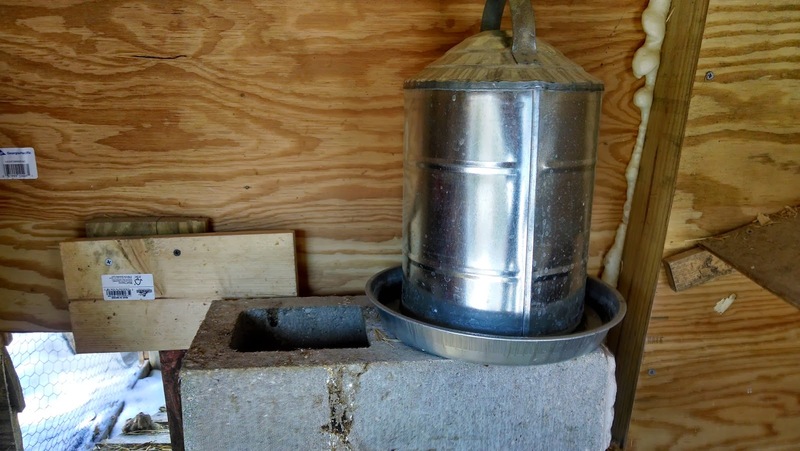 Using a cinder block, I ran a 60W light bulb into one of its chambers and then sat the water dispenser on top. 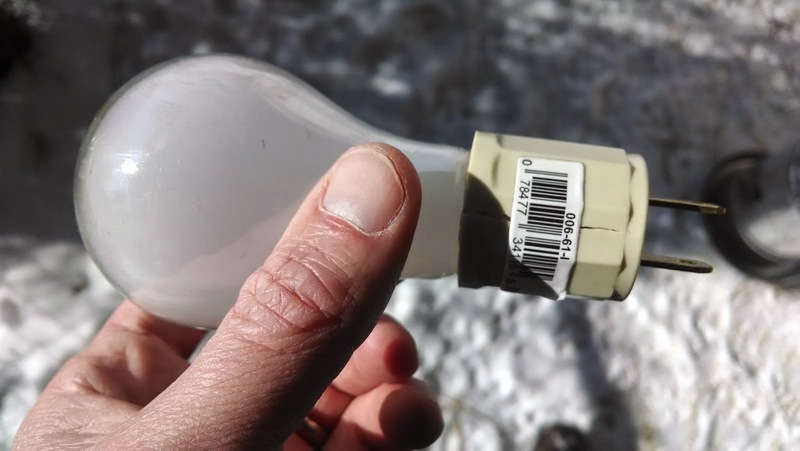 The heat from the light bulb is concentrated just enough to keep the weather above freezing. It's worked perfectly all winter and hasn't been a blip on the electric bill. 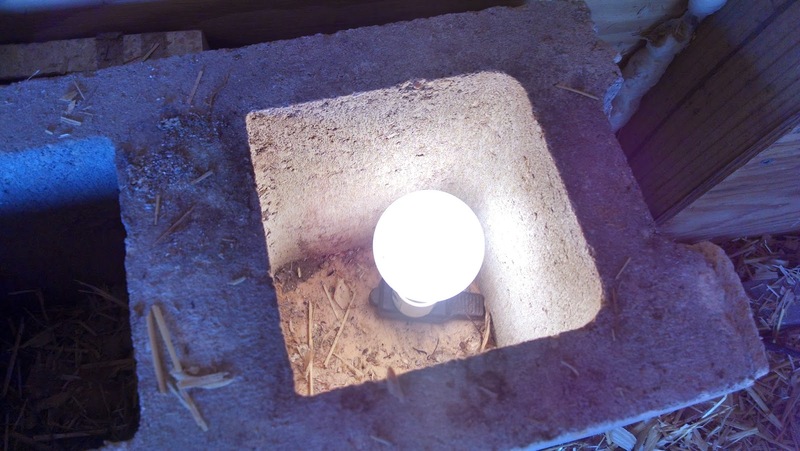 One trick to make the cinder block easier is to chisel away a small slot on the bottom of the block so the extension cord slides in more easily. Also, a note about safety. 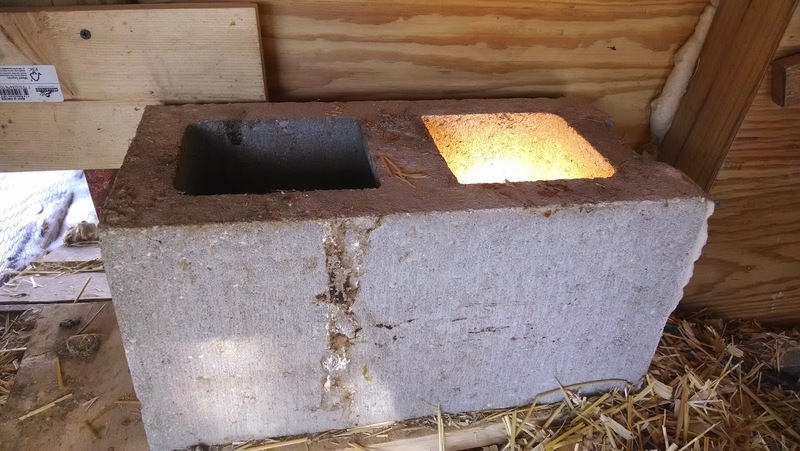 Make sure the cinder block sits up high and doesn't get caught up in any hay or pine chips. Fire is a real concern with this setup. When it gets this cold, the ladies get a heat lamp and warm oatmeal. Call me soft. Charlie and I have been busy winterizing the new coop for the chickens and we started with the coop door. The artwork is courtesy of Charlie. His little Banksy for the ladies. 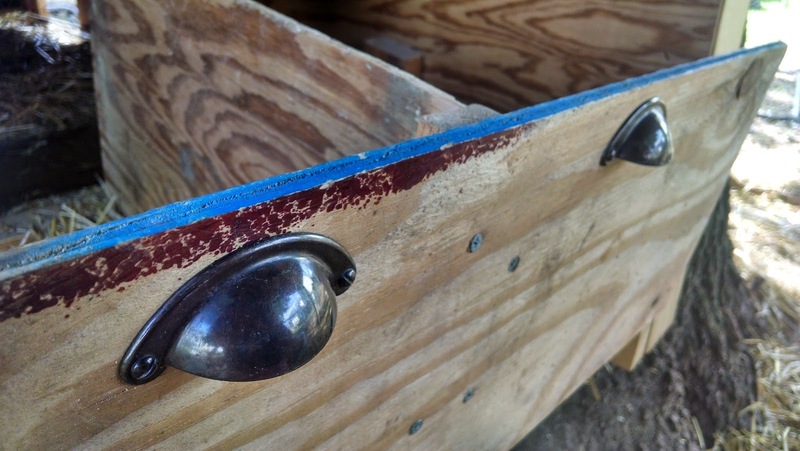 We whacked on nails and screws and pieced together a bunch of scrap wood to build a sliding pocket for the door to keep the cold drafts out. The highlight is the stick which is exposed on the outside of the coop so Charlie can open and close the door without having to go inside the coop. By the way, that stick is a piece of molding from the original kitchen when we bought the house. We picked up four new chicks - three weeks old - this weekend! We have two Buff Orpingtons named Lumi and Wendy Peppercorn and two Black Stars named Crusher and ?? (and chicken to named later). 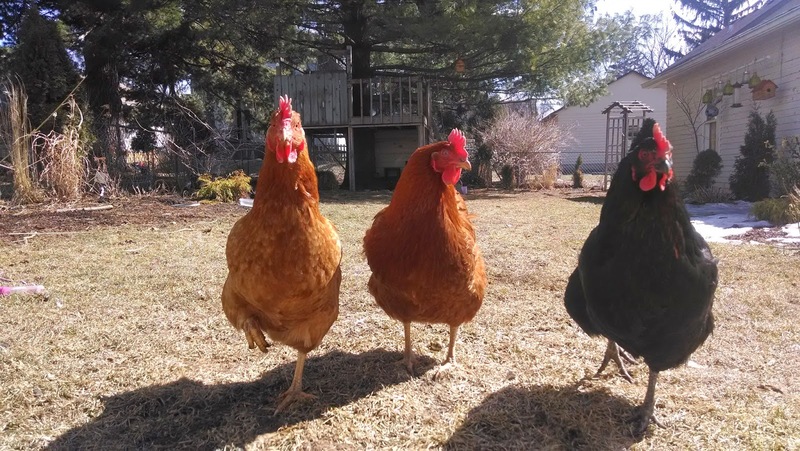 The coop needs a re-configuration to keep these ladies through the winter, but we're excited to start this over with some babies. It's the end of the season and as I archived the last of the to-do cards on my Trello board for the chickens, I got a great message that was spot on. The coop is closed. My father-in-law took the chickens back to their original farm last weekend and we were left with a dirty coop and "eggs" reappearing on the grocery list. It was a great summer. The kids and I are already planning for the next chapter - raising baby chicks! One third of the fish experiment failed three hours in. Charlie thought it worked out just fine for the chickens.